H.L. Mencken, the Jazz Age scribe who loved Baltimore and booze in equal measure, spared no opportunity to praise his state’s famous rye whiskey. This November marks the inaugural Maryland Spirits Month, a celebration of Maryland’s diverse and innovative spirits and distilling industry. Kicking off on Thursday, November 1, 2018, the Maryland Distillers Guild has partnered with the Maryland Office of Tourism to recognize November as Maryland Spirits Month. 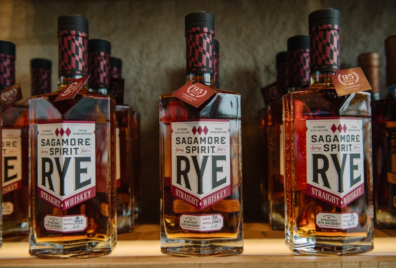 Once famously known for Maryland Rye whiskey and Eastern Shore-produced rums, Maryland is home to thirty distilleries producing hundreds of brands and styles of spirits. From grain to glass, many of the spirits made here tell the story of Maryland’s rich agricultural and distilling history. The distilling industry in Maryland has grown tremendously in recent years. Since 2013 the number of businesses producing spirits in the state has grown more than four hundred and twenty five percent, from 7 to 30 distilleries. A culture of craft cocktails and innovative spirits continues to captivate consumers and lead to growth in the industry in Maryland, and across the country. A showcase of Maryland Distillers Guild members will happen at Proof, an inaugural event taking place from 6:00pm to 9:00pm at the College Park Aviation Museum on Friday, November 9, 2018. Attendees at this event can sample spirits and purchase cocktails while learning all the tips and tricks to delicious mixology. Bottle sales of spirits will be available for attendees to build their home bars and participating distilleries will compete for the evening’s best cocktail recipe. Offering tours, tastings, retail sales, and an education for spirits consumers, Maryland’s distilleries are open for business and serve as destinations for spirits drinkers and enthusiasts from the entire mid-Atlantic region. Interested spirits tourists are encouraged to schedule a day trip to a distillery or an overnight visit to a historic Maryland city with more than one distillery. (BALTIMORE, MD) – The Maryland Distillers Guild (MDG) invites spirits enthusiasts to a new event called “Proof” from 6:00 pm to 9:00 pm on Friday, November 9, 2018 at the College Park Aviation Museum. This unique event celebrates Maryland’s distilling industry and aims to educate consumers about the distilling industry and crafting perfect cocktails. “Proof is a unique opportunity to showcase our diverse Maryland distilleries from across the state – bringing distillers, spirits, and cocktail culture together in one location,” says Jaime Windon, owner of Lyon Distilling Company and president of the Maryland Distillers Guild. Both the programming of the event and the venue itself make Proof stand out from typical fundraising festivals. Serving as a fundraiser for the Maryland Distillers Guild, Proof is the industry’s marquee event during Maryland Spirits Month. “Maryland Spirits Month is not only about celebrating the resurgence of spirit production in our state,” Windon says, “but also about empowering our consumers to create their own dynamic bar carts at home, for effortless enjoyment of our delightful and historically significant spirits.” Covering the month of November, Maryland Spirits Month celebrates the renaissance of the Free State’s storied distilling industry and serves as a reminder to those visiting Maryland that the state offers diverse and rich experiences. During Proof, attendees are invited to sample spirits from a dozen Maryland distilleries, purchase cocktails to enjoy during the event, and buy bottles to curate their home bars. Tori Pratt, founder of Pratt Standard Cocktail Company, is hosting three small-batch, hands-on seminars for guests to learn how to craft balanced and delicious sour cocktails. Cocktails prepared by the participating distilleries will face off in a competition, judged by event attendees and professional judges. To ensure everyone attending this event has a safe and fun evening, CAMBRiA Hotel College Park is offering discounted room rates for those guests participating at Proof. Tickets for Proof can be purchased via the Maryland Distillers Guild website. For more details about Proof, Maryland Spirits Month, or the Maryland Distillers Guild follow MarylandDistillers on Facebook or MarylandSpirits on Twitter and Instagram. Members of the Maryland Distillers Guild are a community of craft producers, dedicated to developing quality spirits and delivering a dynamic experience for visitors. We invite you to tour our distilleries, learn about our distilling processes, and sample locally-crafted spirits. Cheers to a rich heritage and spirited future! Proof is on Friday, November 9, 2018 from 6:00 pm to 9:00 pm. Tickets to Proof are $35.00 per person and include event entry, spirits samples, access to purchase mixed cocktails and full bottles of spirits. To purchase tickets to this event, click here. All event proceeds support the Maryland Distillers Guild and its efforts to promote Maryland’s distilling industry. “Wine and beer may get more attention, but distilled spirits have a solid place in American culture and history. With how the industry has grown over the last decade, they’re set to be back in the limelight. We’re not knocking the classic vineyard tour or evening at a brewery, but if you’re looking for a tasting with an extra kick, try visiting a distillery…” To read more, click here. The Northeast Sustainable Agriculture Research and Education (SARE) Program is accepting applications for 2019 Farmer Grants. These grants are intended for farm business owners and managers who would like to explore new sustainable-production and marketing practices, often through an experiment, trial, or on-farm demonstration. Awards are capped at $15,000 and projects may address the wide range of issues that affect farming in the Northeast. Northeast SARE will host a Farmer Grant webinar on Oct. 10 from 12:30 to 1:30 p.m. Carol Delaney, grant program coordinator, will provide information on program eligibility, how to apply, types of projects SARE funds, allowable expenses and more. The webinar is free. To register, visit http://go.uvm.edu/farmergrant19. To request a disability-related accommodation to participate, contact Debra Heleba at (802) 651-8335, ext. 552, by Oct. 3. Application materials, including detailed instructions and supporting documents, are posted on the Northeast SARE website at www.northeastsare.org/FarmerGrant. Questions about the grant program should be directed to northeastsare@uvm.edu. Applications are due by November 27, 2018. “With a new name, the Baltimore Whiskey Co. — now known as Baltimore Spirits Co. — will open its new distillery inside Union Collective on Sept. 15. Founded in Remington in 2015 by friends Max Lents, Eli Breitburg-Smith and Ian Newton, the brand announced plans to move in June 2017 to the new manufacturing and retail complex in Medfield. After months of construction and moving, the company — known for its Epoch Rye whiskey, Shot Tower Gin and other spirits — is in the final steps of opening its doors, said Lents…” To read more, click here! “The Baltimore Whiskey Company waited three years to release its aged rye whiskey. Last month, the wait paid off in a major way. The distillery, which is in the process of moving to Medfield’s Union Collective from Remington, won the San Francisco World Spirits Competition’s Double Gold, the highest honor from the national competition, for its Epoch Straight Rye Whiskey…” Click here to view the full article & the list of all Maryland winners! McClintock Distilling won a double gold medal for it’s Reserve Gin at the ninth annual New York International Spirits Competition. The 2018 competition featured spirits from more than 29 countries and 60 categories. More than 600 spirits from around the globe were submitted to the competition and judged in a blind taste test by top industry buyers. McClintock Distilling was one of only two distilleries worldwide to be awarded double gold for gin. McClintock was also named Maryland Gin Distillery of the Year and was awarded a bronze medal for its Maryland Heritage White Whiskey…” Click here to continue reading!